Here is one simple real-time working example where a Queue class can be used. When you walk into a bank or a passport office, you will collect a token and wait in the queue for your token number to be called. From the application perspective, when a token is issued, the token number will be added to the end of the Queue. When a representative at the counter is available to server a customer, he will push the "Next" button and the token number that is present at the beginning of the queue, will be dequeued. 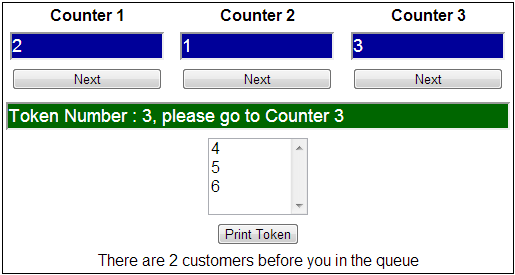 So, this is one example, where a Queue collection class can be effectively used. <asp:TextBox ID="txtCounter1" Width="150px" Font-Size="Large" runat="server"
<asp:TextBox ID="txtCounter2" Width="150px" Font-Size="Large" runat="server"
<asp:TextBox ID="txtCounter3" Width="150px" Font-Size="Large" runat="server"
<asp:Button ID="btnCounter1" Width="150px" runat="server" Text="Next"
<asp:Button ID="btnCounter2" Width="150px" runat="server" Text="Next"
<asp:Button ID="btnCounter3" Width="150px" runat="server" Text="Next"
<asp:TextBox ID="txtNextToken" Font-Size="Large" Width="500px" runat="server"
<asp:Button ID="btnPrintToken" runat="server" Text="Print Token"
Thanks for the video. Very nice explanation. I want to add something. We can essentially get the same result if we use "oncommand" event for all the three "Next" buttons and can handle in a single method instead of 3 separate methods for the button click events.